Former British Prime Minister Tony Blair expressed optimism on Thursday for a more peaceful Middle East, given recent developments in the region. Speaking at the “From Balfour to Brexit” Conference held at Mishkenot Sha’ananim in Jerusalem, Blair said Arab leaders were beginning to rethink their decades-old opposition to the Jewish state. 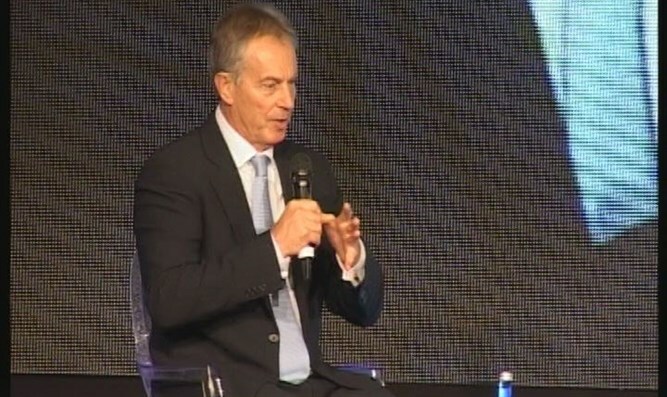 In addition to Blair, the conference also featured Lord Roderick Balfour, the 5th Earl of Balfour, and descendant of Lord Arthur Balfour, Leader of the Opposition MK Isaac Herzog (Zionist Union) and former Israeli Foreign Minister MK Tzipi Livni (Zionist Union), among many other British and Israeli politicians, diplomats, journalists and other opinion-shapers. Many of the speakers focused on the UK-Israel relationship, against the backdrop the 100 year anniversary of the Balfour Declaration and the upcoming exit of Britain from the European Union. During the conference, a new Sir Naim Dangoor Center for UK-Israel Relations was inaugurated at Mishkenot Sha’ananim by his son David Dangoor, businessman, philanthropist and former President of the Board of The S&P Sephardi Community, the oldest Jewish community in the UK spanning over 350 years, in the presence of Tony Blair. Moti Schwartz, Director General of Mishkenot Sha’ananim the international cultural institution and conference center located in Jerusalem which hosted the event, spoke about the center’s activities.